Been invited to a wedding? Have no idea what to wear? Then we are here to help! 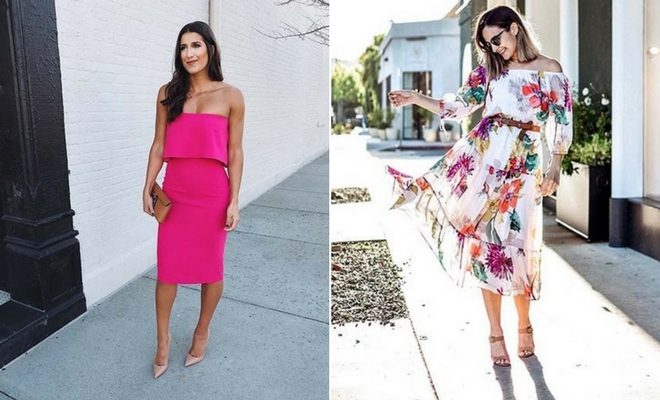 We have found 21 gorgeous wedding guest dresses for summer. There is a dress for everyone – from romantic floral prints to bold and bright colors and more. No matter if the wedding is on a beach or at a glam venue, we have a dress for you. Take a look to get some inspiration! A must-have color for the summer is pink. Not only is pink stylish, but it is also one of the colors of romance which makes it perfect for a summer wedding! With that said, our first dress idea for wedding guests is this vibrant pink fitted dress. As you can see it looks beautiful and is perfect for a special event. You can also choose a different shade of pink or a different style of dress. An easy print to wear at a wedding is floral. Our next idea is a great example of how to wear a floral print for the occasion. The dress is light which makes it look summery, it has an elegant pink print and the frills are a stylish feature. A dress like this can be worn by anyone and will look beautiful at any wedding. Next, we have a beautiful blue dress idea. The dress is off the shoulder and has broderie anglaise or English embroidery. This embroidery is a stunning choice for the summer because it is stylish and light. You can have a dress with this technique in any color. Bring some vintage glamour to the wedding with a dress like the one featured. 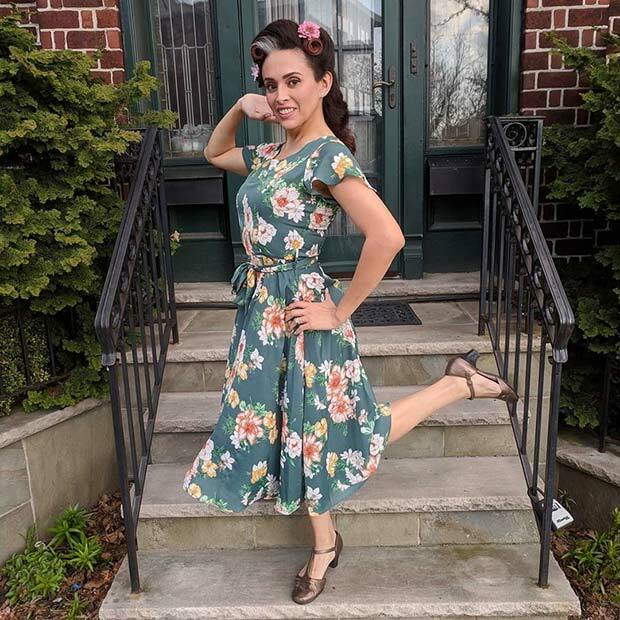 The floaty dress has a gorgeous floral print and belt. You can get similar dresses like this in all prints and colors so you can choose a dress that is perfect for you. Wear with a hairstyle like the photo to complete your vintage look. Off the shoulder dresses are perfect for the summer. This next idea shows how to wear the style in an elegant way for a special occasion like a wedding. The fitted dress is in a pretty, light color and has a frill feature. You can get dresses like this that are floaty too. Wear with statement shoes or sandals that color match the dress. A belt can make a big difference to the way a dress looks. Belts can show off your waist and can make long, floaty dresses look more fitted. 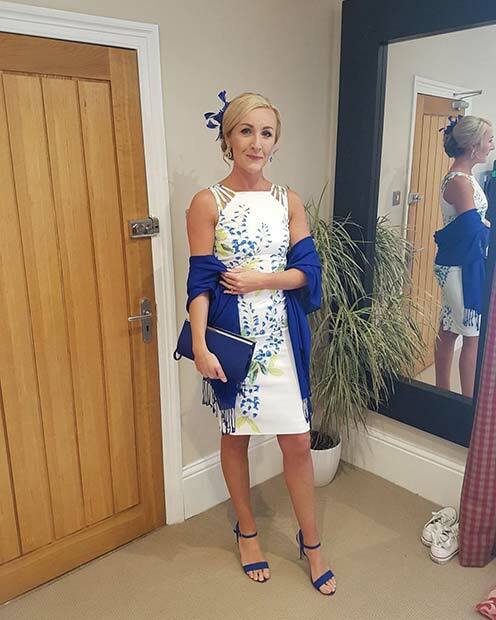 Here is a great example of how you could style a belt with a floral dress. It is a beautiful look that would suit a summer or beach wedding. Another way to jazz up a wedding guest outfit is with accessories. Here we have an outfit that is made up of a white dress and bold blue shoes, bag, shawl and hair accessory. The key to creating a colorful but elegant outfit like this is by choosing a color from a print. As you can see, the dress has a blue and green print and the accessories use the blue. You can create a similar look with any color. A very popular color choice for weddings is purple, particularly light purple. 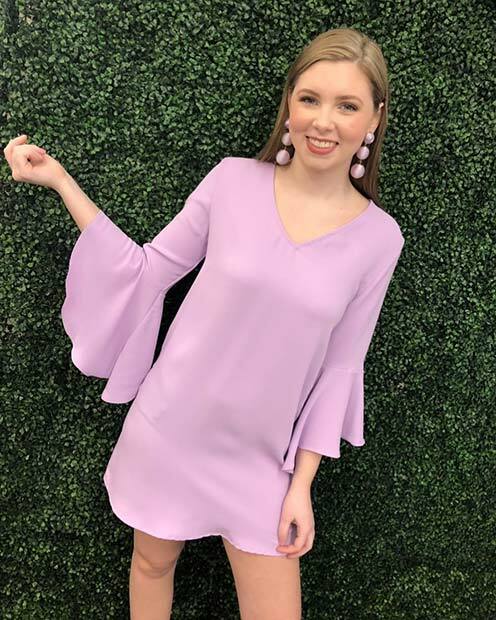 Our next outfit idea features a super cute purple dress that is perfect for a summer wedding. The dress has beautiful sleeves and is elegant. With a dress like this you can match the color for your accessories too. There are many dress options in a similar color to suit anyone. Going to a beach wedding? Then this next dress could be the perfect choice. The dress is light, summery and stylish. It is short and has a beautiful frill detailing. A dress like this would look amazing on the beach but you can also glam it up with some heels and sparkly jewelry for other weddings in the summer too. Long maxi dresses are a great choice for a summer wedding. These dresses will keep you cool but look very trendy too. The dress featured is a gorgeous example of what type of long dress you could wear at a wedding. It has a beautiful off the shoulder design and the print is elegant. Anyone would look amazing in a dress like this.